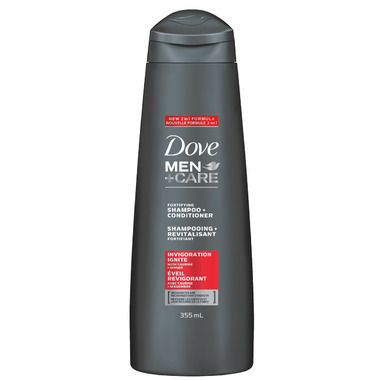 Dove Men+Care Invigoration Ignite Fortifying Shampoo and Conditioner, with taurine + ginger, leaves hair visibly healthy and more resilient. This 2-in-1 shampoo and conditioner designed specifically for men, both cleans and conditions, delivering a powerful boost of energy while invigorating hair. Recharge with Dove Men+Care Invigoration Ignite Fortifying Shampoo and Conditioner. This unique proprietary Dove Men+Care formula cleans and conditions in just one wash. This shampoo and conditioner is engineered for men who want stronger and invigorated hair. An energizing boost that simultaneously strengthens hair. Ingredients: Aqua, Sodium Laureth Sulfate, Cocamidopropyl Betaine, Sodium Chloride, Parfum, Dimethiconol, Carbomer, Menthol, Citric Acid, Guar Hydroxypropyltrimonium Chloride, TEA-Dodecylbenzenesulfonate, Tetrasodium EDTA, DMDM Hydantoin, Sodium Benzoate, Caffeine, PPG-9, Zingiber Zerumbet Extract, Taurine, Euterpe Oleracea Fruit Extract, Methylchloroisothiazolinone, Methylisothiazolinone.